Abi Hynes enjoys an audience with Carol Ann Duffy, discussing poetry, writing and life. This was my first encounter with our delightfully local Poet Laureate, despite the fact I’ve been a fan since I was a teenager. She was the first poet I studied at school that I felt any sort of connection to; perhaps, thinking back, because she was probably the first living poet I’d spent any time reading. I remember, in particular, being sixteen and totally mesmerised by the sapphic sensuality of Warming Her Pearls. No surprises there, then. The Sunday evening in Hallé St Peter’s was a surprisingly warm affair, thanks in no small part to Rachel Cooke’s affectionate, low-key hosting and interview style. Despite the packed-out hall, her chat with Duffy – interspersed with readings of poetry that encompassed pieces from her earliest collections to her latest works – gave me the feeling of sitting, childlike and in awe, in the poet’s living room, listening to the fascinating chatter of the grownups and staying quiet to avoid being sent to bed. And she read Warming Her Pearls – just for me, of course. In theory, the event was supposed to be in honour of Duffy’s Collected Works (brought about by the ‘hideous autobiographical fact of turning sixty’), which – due to printer troubles – were actually absent. It didn’t matter a bit. It was an insightful and beguiling evening spent in good company that left me heading for home all fuzzy-round-the-edges. On a side note: serious props to the very hard-working roving mic guy, who ran the length of that hall several times to keep the Q&A on its toes. Nicely done. 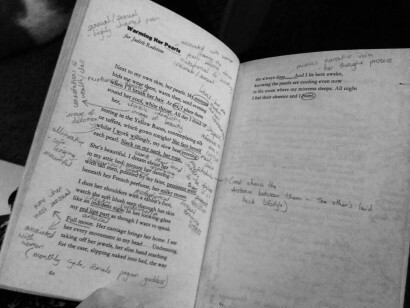 Image: the writer’s copy of ‘Warming Her Pearls’ annotated with her A-Level notes, courtesy of Abi Hynes.